Silvia Lopez move d to the United States from El Salvador more than 29 years ago, escaping the civil war that plagued the country from 1980 to 1992. 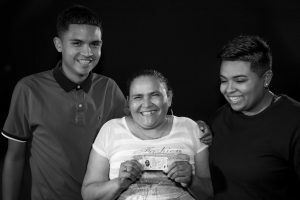 When Silvia first arrived in 1989, she began the arduous process of applying for asylum and later for a green card under a special law called the Nicaraguan Adjustment and Central American Relief Act (NACARA). Slowly, things began to improve for Silvia. She started building a life and a family in Northern Virginia. In her heart, there was no better place to raise two daughters and a son than in the United States. 18 years after she arrived, immigration officials finally interviewed Silvia regarding her asylum and green card applications. Both applications were denied and deportation proceedings were initiated against her. Frantic, she consulted with a friend who had heard of Ayuda. Ayuda assisted Silvia in obtaining Temporary Protected Status (TPS). After Silvia obtained TPS, Ayuda represented her in immigration court and convinced the judge to close her deportation proceedings. From then on, Silvia worked exclusively with Ayuda on all her immigration matters, including multiple renewals of her TPS, an application to travel to see her elderly parents in El Salvador, and a family petition, filed for Silvia by her adult U.S. citizen daughter. In December 2017, after 28 years, Silvia successfully obtain her green card and she is now a permanent resident. Silvia is proud to be a resident and carries her green card proudly. She continues to live and work in Northern Virginia. Both of her daughters are working full-time jobs. Her son plays on the soccer team at Marymount College. Her grandchildren are in school.